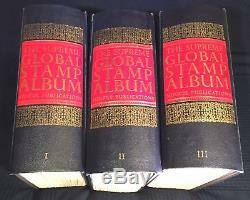 Huge Collection of 20,000+ Stamps Mounted in 3 Minkus Supreme Global Stamp Albums... Plus more than 5,000 additional stamps (unmounted loose and hinged non-Minkus albums). Links to more photos below. Beautiful collection; view photos for your assessment of condition. THE SUPREME GLOBAL STAMP ALBUMs by MINKUS PUBLICATIONS is an excellent choice for comprehensive stamp collectors without requiring an entire bookcase to hold the collection. 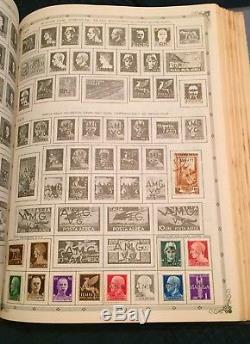 THIS WORLDWIDE COLLECTION IS INTACT; STAMPS WERE NEVER REMOVED or "cherry picked". Collection started in mid-1930's; has not been touched since late-1980's. Past 30+ years in air conditioned, humidity controlled storage. 3 Minkus albums contain over 20,000 stamps. Stamps cover mid-1800's to late-1900's. All Minkus pages are clean, with ZERO pen/pencil markings, etc. The original Vol I & II box indicates there are 2,816 pages in the 2 volumes and Vol III was necessary due to the expansion via Minkus updates. Mix of mint/new stamps and cancelled/used stamps. Due to the structure of Minkus albums, mounted stamps are unique (although a few duplicates may exist on blank expansion pages). Overwhelming majority of the stamps in the Minkus albums are sound and properly placed. 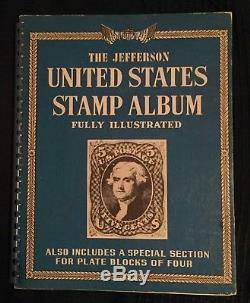 In addition to the Minkus albums, 3 other books with hinged stamps will be included; these were used before the Minkus albums were acquired -- reference in counts below as "Jefferson US", "Regent", and "notebook". AND included are approximately 5,000 mint/NH stamps and used/cancelled stamps (primarily in glassine envelopes); about 3,000 are grouped by country and aonother 2,000+ are unorganized. LINKS to additional photos: (images are intended to assist in your assessment of collection quality). 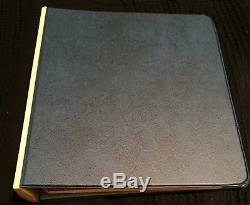 Australia stamps in Minkus albums 7 images. Canada stamps in Minkus albums 8 images. Minkus Album -- 25 images. Regent Album -- 6 images. 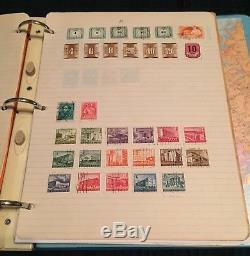 Czechoslovakia stamps in Minkus albums 23 images. France stamps in Minkus albums 13 images. 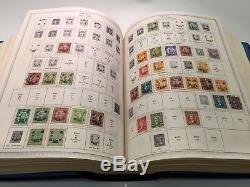 Germany stamps in Minkus albums. Great Britain stamps in Minkus albums 10 images. 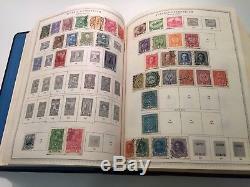 Hungary stamps in Minkus albums. New Zealand stamps in Minkus albums 7 images. Romania stamps in Minkus albums. Russia stamps in Minkus albums. 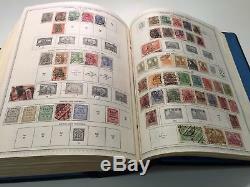 Sweden stamps in Minkus albums 8 images. More photos by country may be provided on request. (Austria, Belgium, China, Czechoslovakia, Germany, Hungary, Mexico, Netherlands, Paraguay). Thomas & Prince Islands, Spain, Sweden, Switzerland, Turkey. Pre-Minkus Albums sample pages +. 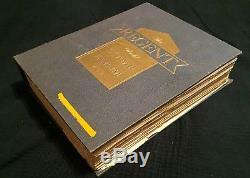 (Jefferson US, Regent, notebook, and blank Minkus update pages). NOTE: ALL STAMP COUNTS ARE ESTIMATES but will closely match the actual number delivered The items in the collection and what you will receive include. 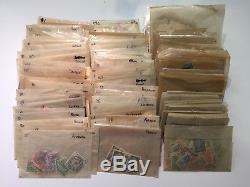 20,000+ stamps in 3 Minkus Albums with OEM boxes. 7,700 stamps (Vol I). 5,775 stamps (Vol II). 7,225 stamps (Vol III). More than 3,000 grouped by country. 1,000+ stamps in 3 pre-Minkus books. 70 stamps -- Jefferson US. Minkus update pages -- not sure if these are needed. Detail stamp counts by country & disposition follow. Danzig (now part of Poland). Fezzan (now part of Libya). Ifni (now part of Morocco). Katanga (now part of Congo). Lourenco - Marques (now part of Mozambique). Quelimane - Tete (now part of Mozambique). ish Western Sahara - Sahara. Wurttemberg (now part of Germany). Zambezia (now part of Mozambique). 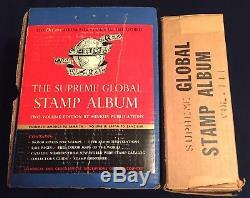 The item "20,000+ Stamp Collection in 3 Minkus Supreme Global Albums & 5,000+ items bundle" is in sale since Friday, September 29, 2017. This item is in the category "Stamps\Worldwide\Collections, Lots". The seller is "scantler" and is located in Brandon, Florida. This item can be shipped to United States, Canada, United Kingdom, Denmark, Romania, Slovakia, Bulgaria, Czech republic, Finland, Hungary, Latvia, Lithuania, Malta, Estonia, Australia, Greece, Portugal, Cyprus, Slovenia, Japan, China, Sweden, South Korea, Indonesia, South africa, Thailand, Belgium, France, Hong Kong, Ireland, Netherlands, Poland, Spain, Italy, Germany, Austria, Israel, Mexico, New Zealand, Singapore, Switzerland, Norway, Saudi arabia, Ukraine, United arab emirates, Qatar, Kuwait, Bahrain, Croatia, Malaysia, Brazil, Colombia, Panama, Jamaica.